Gallery XV specializes in a variety of art, antiques, jewelry and collectibles. (This item is located in Gardena, CA). ••••••••••••••••••••••••••••. We make a best effort to provide a fair and descriptive condition report. This is a gorgeous French box from the 19th century. Overall condition is very good. The hinge is in good working order. The handle to open and close does not catch on the bar of the brass mount. Faintly stamped on the bottom we believe 2197 and marked 57. Keren Kopal is a designer of decorated works of art. As an art and antique collector Keren was inspired by the. under the supervision of the artist Keren Kopal. About the Artist Keren Kopal. 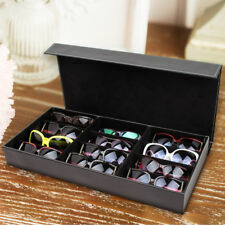 All models are original creations of the "Keren Kopal Collection" in limited series. ANTIQUE FRENCH BRASS & CRYSTAL JEWELRY BOX/CASKET APRICOT GLASS GORGEOUS! A vintage possibly antique French crystal jewelry box/casket box. Featuring beautiful apricot colored glass and delicate gilt brass work with a wonderful figural scene of maidens and angel on the back interior. The interior bottom is lined with a pin tufted velvet cushion. The box measures approximately 7" in diameter and 4.5"h. There are some light surface and tarnish to the brass. The velvet cushion is missing one pin and is faded showing signs of wear. No maker's marks were observed. Absolutley gorgeous piece for your vanity!. Marked F & B (inside flag) and Sterling. Glass has no cracks but a few scuffs on bottom that can not be seen unless flipped over, a few tiny flea bites around rim under where lid sits. Sterling lid has a few small dings thta can be seen in photos. Signature in right lower corner. BAMBOO INLAY ON WOODEN TRINKET BOX WITH HINGED LID - VERY INTRICATE DESIGN! Bamboo inlay trinket bos with hinged lid. Raised Floral Design. Makers Mark on reverse. Weight 12oz. Condition: Fair Condition. Significant oxidation and wear to the silverplate. Gallery XV specializes in a variety of art, antiques, jewelry and collectibles. This piece is a Crummel's Enamels trinket box with a floral pattern on the top of the box with "All My Love" inscribed in the middle. On the inside, it shows the outline of flowers. Dimensions: Lenght- 2 inches Width- 2 inches Height- 1.25 inches. 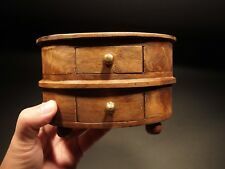 This is a Tall Wood Carved Box that Opens. I am unsure what this box was originally intended to hold. It does appear to be a Religious Christianity Woman In Prayer Carving. Was it designed to hold candles?. Antique Victorian Scene Jenning Brothers JB Trinket Casket Box. wear with age/use. marked JB 2555 on bottom of piece. beautiful scene on top and decoration all around sides. Good condition. Ready to use. The lion heads on the side, holding brass rings in their mouths look English, the flowered borders running around the edges of the lid and body look French, and the eagle insignia on the front looks German. The underneath of the lid has an engraved lettering near the edge that reads Made in with a hallmark that is probably German so this was most likely made in Germany. Wonderful marbleized opaline glass box with deco design the top. Green marbleize color. 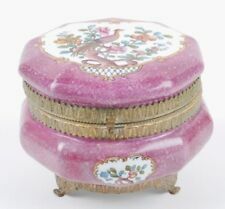 This is a rare and unusual box for opaline glass box collectors or just for its beauty. We are willing to do all we can to sort out any problems. Hinweis fur internationale Kaufer. The dark is dust/trashunderneath the plastic wrap and not on box. Lightweight and very study box. This beautiful box was masterfully crafted by Wedgwood in England and features the exquisite Square Taupe Jasperware design with White Scallop Shell accents that I KNOW has a spot in your collection, or would be a perfect gift! Beautiful Cat In High Heels Trinket Box. Condition is Used. Shipped with USPS First Class Package. The pentacle is a symbol of protection. There are also 5 virtues; Love, Wisdom, Truth, Kindness, Justice. For sale is a Tiffany & Co Texas Blue Bonnets round trinket box for Tu Electric. Use pictures for condition. The stand (not by Crummles) is included. Wood chest of drawers has a butterfly and dandelion design. Mini Drawer Chest. 12" lenght x 10"width x 8"tall. Up for sale is a handmade jewelry or trinket box made by Fred & Marilyn Buss of California, circa late 20th Century. Portmeirion Mini Copper Enamel Hinged Box Made In Britian W/Original Box. Condition is Used but excellent condition. Shipped with USPS First Class Package.